Install a convenient sink and work area in your business with the Eagle Group 414-18-3-24 three 18" bowl stainless steel commercial compartment sink! This compartment sink features three large 24" x 18" sink bowl with a 13 1/2" water level, coved corners, and swirl drains for excellent water retention and drainage, and its drainboard provides ample space for glass and dish racks throughout the day. Its heavy gauge stainless steel top and sink bowl provide outstanding, long-lasting durability, while the 9 1/2" backsplash has a 1" upturn and 8" centers for easy faucet installation. Its 1/2" IPS water supply is designed for easy connection to your water lines, and thanks to its 1 5/8" O.D. galvanized legs and 1" high impact adjustable bullet feet, this compartment sink is reliable and sturdy. 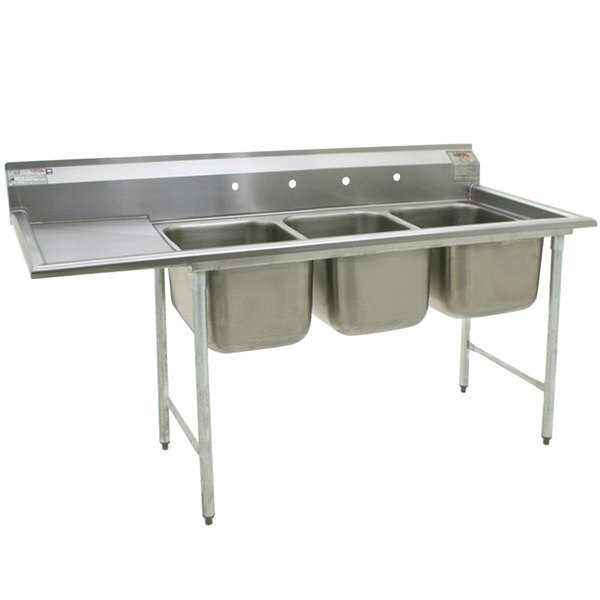 Left to Right: 86 3/4"
Front to Back: 31 3/4"
Advance Tabco 9-83-60-36RL Super Saver Three Compartment Pot Sink with Two Drainboards - 139"
Advance Tabco FE-3-1515-15RL Stainless Steel 3 Compartment Commercial Sink with 2 Drainboards - 75"
Advance Tabco 94-43-72-24RL Spec Line Three Compartment Pot Sink with Two Drainboards - 127"
Advance Tabco FC-3-1620-18 Three Compartment Stainless Steel Commercial Sink with One Drainboard - 68 1/2"
Advance Tabco 9-23-60-18RL Super Saver Three Compartment Pot Sink with Two Drainboards - 103"